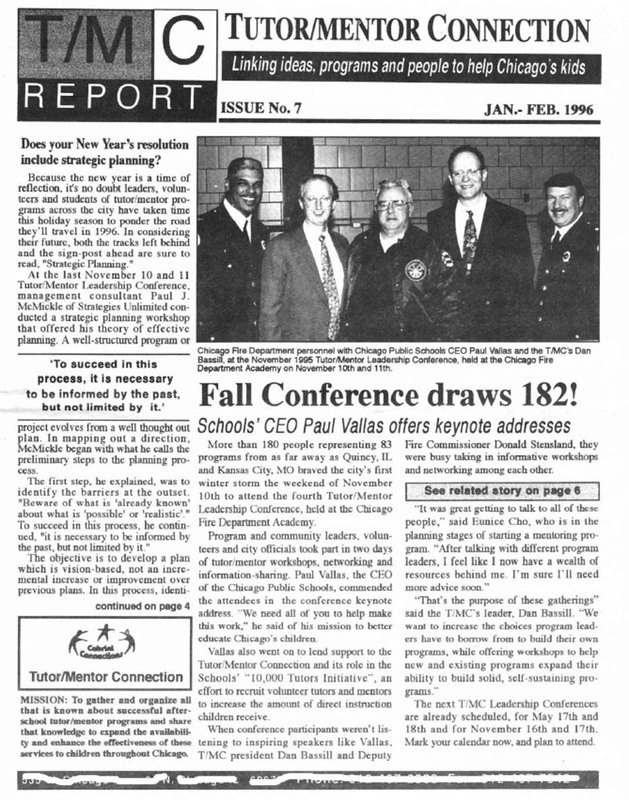 Over the past few months I've uploaded copies of newsletters from the 1990s and began to post maps showing participation in past Tutor/Mentor Leadership and Networking Conferences. I use these to demonstrate work I've been doing for more than 20 years, and to invite support to continue this work in the future. 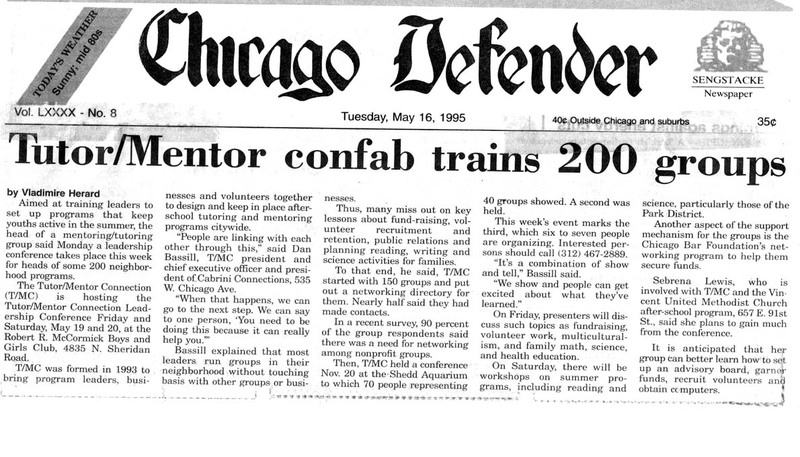 I've hosted a Tutor/Mentor Leadership and Networking Conference in Chicago every six months since May 1994, to connect programs and supporters with each other, share ideas that can help each program constantly improve, and to create greater public attention for all tutor/mentor programs in Chicago. From 2006 to 2011 I was supported by alumni from Northwestern University who were part of a Public Interest Fellowship Program. I encourage you to read articles they wrote about past conferences. By organizing conferences every six months, and a Chicagoland Tutor/Mentor Volunteer Recruitment Campaign every August/Sept. 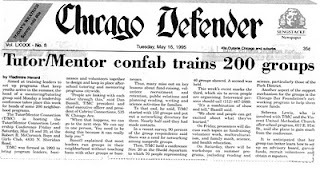 from 1995 through 2003, I was able to generate a number of stories in print, radio, TV and the Internet, expanding attention and support for volunteer-based tutor/mentor programs all over the Chicago region, not just for the Cabrini Connections program I was leading in the Cabrini Green area of Chicago. This strategy was part of an on-going effort intended to build greater support for tutor/mentor programs so each could borrow ideas from other programs in Chicago and the US and constantly improve their impact on young people. This strategy was never consistently supported by CPS, the Mayor's office, philanthropy or business, yet it continued year-after-year for 20 years. Due to changes at Cabrini Connections in 2011 I'm no longer operating under a 501-c-3 non profit structure so it has been much more difficult to find the money needed to do this (even though it was almost impossible in the past!). Yet, as this article says, "the difficulty of success does not relieve one of the obligation to try". I also have written about the conference on this site. In addition I've written about learning, network building, collaboration and leadership strategies. The next conference will be held on June 7, 2013 at the Metcalfe Federal Building. I'm organizing workshops now. See this list of suggested topics and use this form to submit a workshop proposal. I'm not operating as a non-profit yet still need sponsors to support the conference and the Tutor/Mentor Institute, LLC. 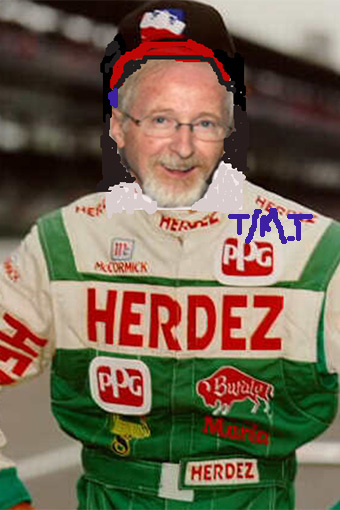 I wrote this article to suggest that if companies are willing to put their names on race car driver uniforms, we should be able to encourage the same type of support for people helping youth become their future workers. 20th Year of Tutor/Mentor Connection. I've shown what I've been able to do with a little money in the past. I hope you'll help shape the future with a donation or a sponsorship. Story Telling. Violence. The Future. In Sunday’s Chicago Tribune entertainment section Chris Jones wrote an article titled “Violence, Chicago and its story tellers.” I hope you'll read it. Mr. Jones wrote about how the creative community has begun to use their talent and national platforms to draw attention to the gun violence in Chicago. He wrote that artist are not only trying to put a face on victims, but are "trying to search for causes, solutions and prevention". He asks “Are the stories behind the violence in Chicago understood in a Wheaton or Winnetka? and other communities far from high poverty neighborhoods? To the past 20 years I've been using maps and the stories on this blog to try to tell the same story, with the goal of attracting support from people who don't live in poverty for volunteer-based tutoring/mentoring and learning programs operating in high poverty neighborhoods. See example. I posted an animation on Friday showing how sports stars could be more consistently drawing attention to these issues, and drawing needed resources to tutor/mentor programs in different neighborhoods. Imagine how many different ways this story could be told by creative people. Imagine if when Anne Hathaway ended her Oscar acceptance speech by wishing for a day when stories of poverty were only in the movies and not in reality, if she had pointed to a web site where more videos were drawing fans to places where they could become personally involved in the lives of youth and families living in poverty. I've been exploring new ways to share the ideas from this blog and the Tutor/Mentor Institute, LLC web site. This animation demonstrates a role athletes and coaches can take to support the growth of mentor-rich programs in high poverty neighborhoods throughout the Chicago region, or in other cities. This is a pilot video. Others can do this much better, with more creativity. Athletes with their access to high quality creative and video production talent could remake this video with themselves as the featured character. 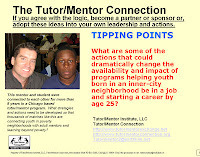 Point to the Tutor/Mentor Program Locator and Chicago Program Links Library if you're in the Chicago region. What do I do? What is a MOOC? I’ve written many articles in the past about learning and network building and since mid January I’ve been part of an Education Technology and Media MOOC #ETMOOC where more than 1600 people are gathering on-line to share ideas about learning, digital story telling, on-line collaboration, etc. Education Technology and Media which you can read about here While I could write a summary of everything I’ve learned, this recap by Paul Signorelli does a great job of showing the value of the ETMOOC. “What does that mean?” the reporter said. I was not able to provide an easy answer in one sound byte. When someone says MOOC, I immediately know what it means, because I’ve been following the growth of this process for more than 10 years. Others don’t know what I’m talking about or why I place so much value in the process. To bring people together to share ideas means someone has to build a list of people a) who have ideas to share; and b) who might come to an event, or an online space, to connect with these ideas. 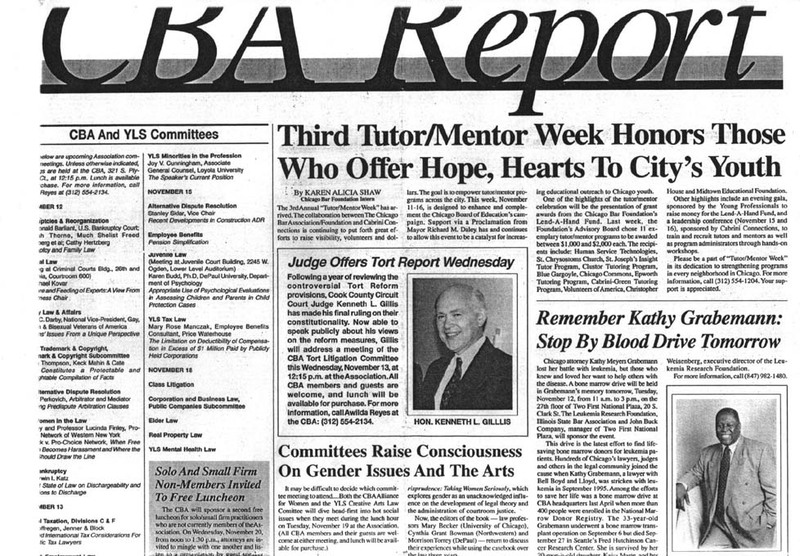 Since 1975 I’ve been building a list of volunteer based tutor/mentor programs, researchers, reporters, business and philanthropy leaders, etc. for over 30 years and have used this to share ideas via print and email newsletters, conferences, and in one-on-one mentoring of different people who are looking for help in finding a tutor/mentor program, starting a program, improving a program, etc. 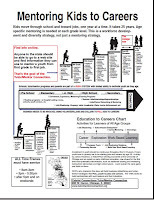 I formalized this process when launching the Tutor/Mentor Connection 20 years ago. 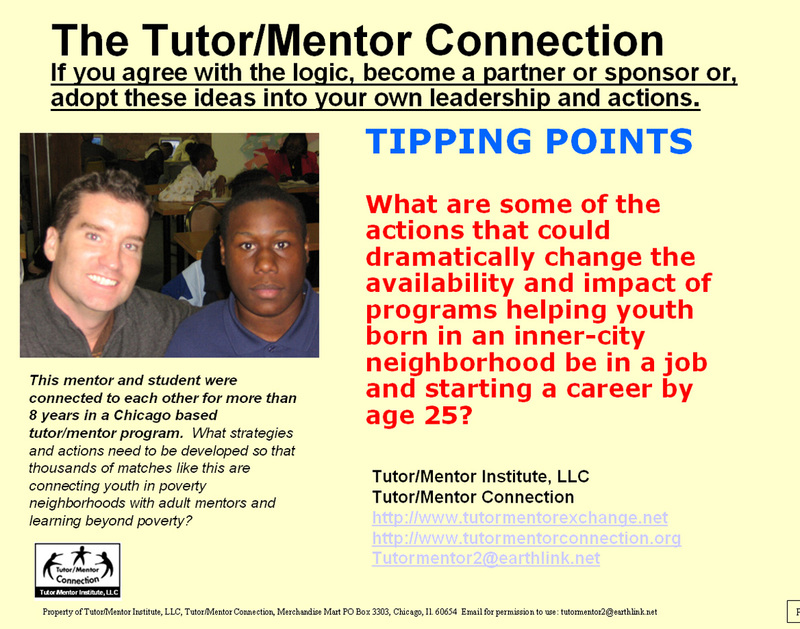 I created the Tutor/Mentor Institute, LLC in 2011 to continue this work. This information collection/sharing process requires constant updating. It’s no small task. Writing newsletters, blogs, maintaining a Twitter and Facebook presence, organizing conferences twice a year, meeting with people to expand the network, etc.are also time consuming, This has been no small task, especially in the third largest city in the US and with less than 2.5 full time staff devoted to the project at its peak. 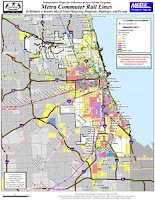 Yet this work is necessary to support the learning of much larger groups of people throughout the metropolitan Chicago region, and the nation, who are also concerned with the well-being of inner city youth and the productivity of our labor force. In the ETMOOC there has been a lot of discussion about “content curation”. Here's one article. In the Tutor/Mentor Connection links library I point to numerous web sites talking about “knowledge management” such as this article. To me these are versions of the same idea. Someone has to be collecting and organizing information so that others can use the information to support communities of practice and collective efforts intended to solve social problems. I’ve been building a knowledge library for more than 20 years, intended to support the involvement of youth, adults, business, media, faith groups, philanthropy, political leaders and anyone else who wants to be part of the “village” needed to help kids in poverty move through school and into jobs and careers. I’ve been learning from the ideas of people throughout the world and as I learn a good idea or find a good resource, I add it to my library and share it via my blog, email newsletter, or in one-on-one mentoring of other people. The ETMOOC focuses mostly on how traditional classroom educators might use these ideas to engage k-12 youth in more effective and motivated learning. My target is adults, not for adult literacy, but to educate them on more ways they might use their own resources to build birth-to-work systems of support in inner city neighborhoods. Yet the people I’m trying to engage in this MOOC-like learning and action planning process are people who have busy full-time lives. That means the first MOOC we need to build is one where many people are sharing ideas for engaging busy people in on-going learning intended to solve social/environmental/health problems that plague many different parts of the US and the world. Knowledge Management and Content Curation involve collecting and making sense of information. However, there’s also a marketing process involved, intending to constantly increase the number of people to become involved in this learning, and who then become involved in supporting the growth of birth-to-work mentoring, tutoring and learning programs in local communities. Using the internet we can gather information that helps us better understand a problem, and that shows how people in other places are working to solve the problem. Instead of constantly reinventing the wheel, or starting from scratch, we should be able to innovate ways to apply good ideas from other places to the work we do in our own communities. This requires content curation, knowledge management, marketing, information facilitation and many other skills. As I said to the reporter I spoke with, “Solving the problem of inner city poverty, youth violence, poorly performing schools and showing the role of mentors in volunteer based tutor/mentor programs is more than a sound byte and one media story”. It requires in-depth learning, thinking and planning that continues over many years with thousands of people involved. I’m trying to support that process through the work I’ve been doing for the past 20 years. Until others spend time learning about the process and understanding its benefits to their own work and lives I’m not sure how I can explain the value to them, or describe what I do, in a few words. 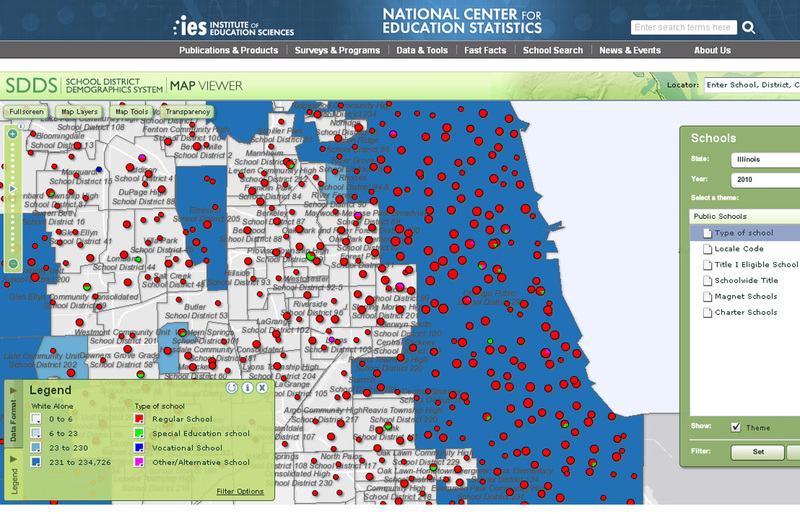 If you're not aware of it, the National Center for Education Statistics has a wealth of data that can be used to understand education issues in Illinois and the US. This map image is one that I created from the data set on this page. This is an article about high school graduation and drop-out rates on a state-by-state level, using an interactive map and data from the NCES site. I saw this article in today's Sun Times and posted my own comment to it, encouraging the Mayor to use some of the ideas I've shared on this blog so he supports constantly improving tutor/mentor programs in every high poverty neighborhood, not just the traditional high profile programs that attract the most support. 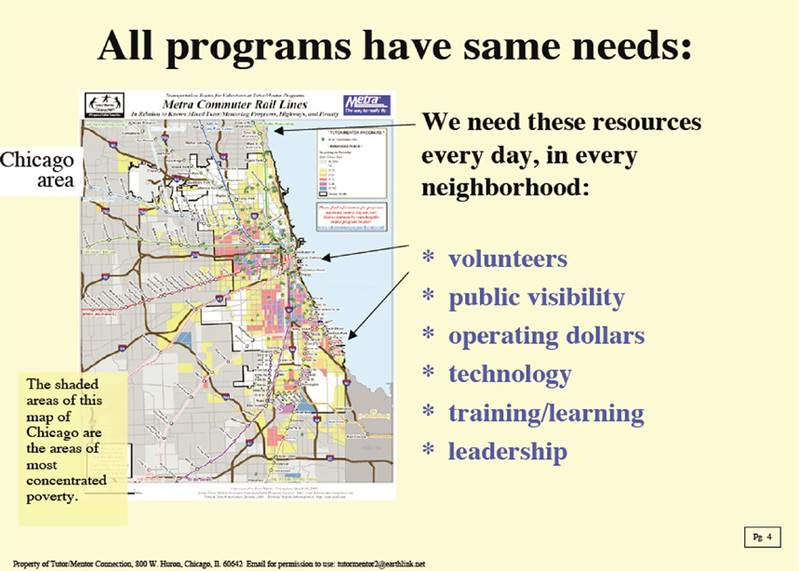 My first suggestion was to use maps, such as provided on the Tutor/Mentor Program Locator, to identify and support programs in every high poverty neighborhood, and to encourage new programs to support where none exist. My second suggestion was to support programs that show a strategy that supports youth for multiple years and engages volunteers from the business community as tutors, mentors, tech support, organizers, communicators, advocates, etc. Look for a "theory of change" or a "logic model" on the organization's web site with graphics and history that demonstrates this commitment. 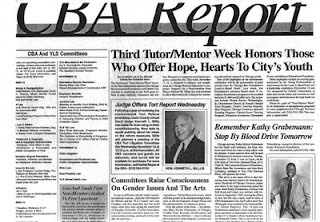 My third suggestion was to encourage every industry and professional group to build a strategy that provides volunteers, operating dollars, technology and other needed support to volunteer-based tutor/mentor programs in every part of the city, such as the Lawyers Lend A Hand to Youth Program has been doing since 1994. 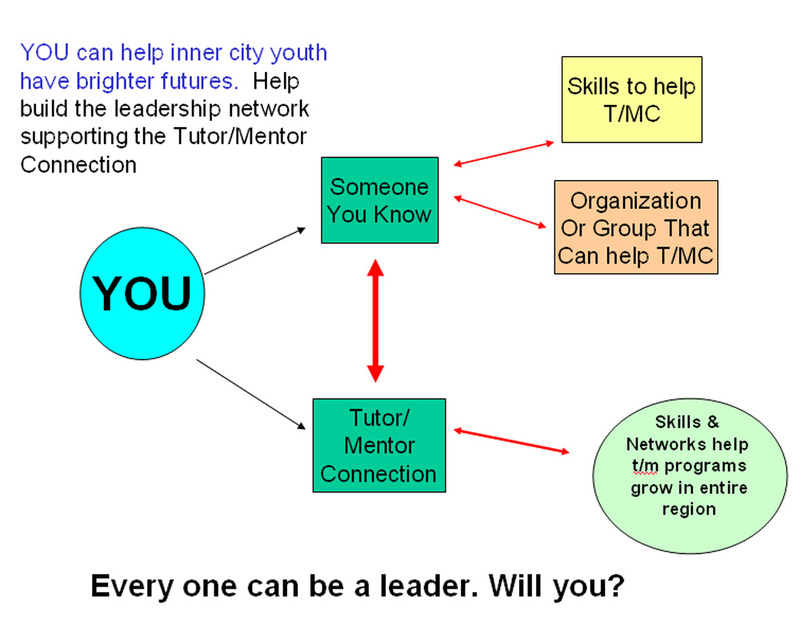 This ROLE of LEADERS PDF is one of many created by the Tutor/Mentor Connection since 1994 that the Mayor could share to encourage leaders in business to support the growth of mentor-rich programs. 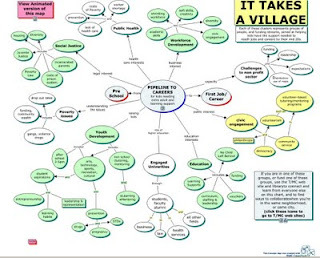 This STRATEGY MAP is one the Mayor could adopt and put on his own web site, and that he could encourage other leader in business, religion, higher education and public health to adopt as part of their own commitment. In a few years will we look back and see a few million dollars distributed to a small group of organizations or will we see a "virtual corporate office" created where volunteers and leaders from every sector are taking roles that support the growth of mentor-rich youth programs in every zip code of the Chicago region where kids have economic disadvantages that most kids don't face? Or will we see a model of support that is being duplicated in every city in the country? In today's Chicago Tribune Salim Muwakkil wrote an article urging us to use Black History month to do more learning about the root causes of poverty and inner city violence. I agree. In fact, I think this learning should take place all year long and in many places. 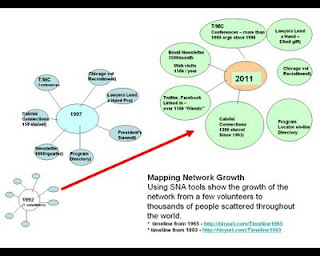 I've written numerous articles about learning and network building on this blog since 2005. I've also created an extensive library of research articles that any group might use for reading, reflection, discussion and learning. And I've created a map based Tutor/Mentor Program Locator that anyone can use to find and support existing tutor/mentor programs or determine where new programs are needed. However, I think that we must find ways to make this learning more important to people who don't live in poverty and who may not be people of color. In the Tribune article retired cop and 20th Ward Ald. Willie Cochran was quoted as saying, "If we are not going to address the traumatic and social and emotional issues, if we are not going to address the economic issues, if we are not going to address the education issues in an honest way, then we are going to continue to have these problems." I go a step further to say if we don't figure ways to get thousand of additional people personally involved, building empathy, understanding and commitment to actions that support comprehensive youth and workforce development systems in high poverty neighborhoods we will continue to be looking at faces of innocent kids lost to inner city violence over the next 20 years or more. I host a Tutor/Mentor Leadership and Networking Conference every six months for this purpose and to help mentor-rich programs grow in high poverty neighborhoods. The next is June 7. I hope some of you who read this will help me find sponsors to pay for the event, and/or will organize workshops to attract more people who care about these issues. While I've incorporated maps in many of the articles I've written on this site, I've also hosted another site focused completely on maps, titled Mapping for Justice. From 2008-2011 the maps and articles on this site were created by Mike Trakan, who was the GIS map maker on the Tutor/Mentor Connection staff. Due to funding cuts and changes in structure Mike's not been with me since early 2011. I've continued to post maps on the site and I encourage you to browse recent articles. 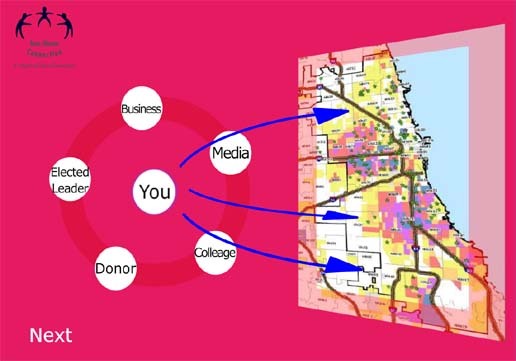 I encourage you to add budget time monthly to browse the articles on this site and the Mapping for Justice site, and use the ideas to form coalitions that help build and sustain mentor-rich non-school programs in your neighborhood or your city. I received an email from MENTOR today announcing that photos, videos and workshop presentations are now available at this link. I’ve been working on a final recap expressing some of my observations. I wrote here and here showing some of the people I met and comments I heard. President Obama is coming to Chicago this Friday in response to the shooting of 15 year old Hadiya Pendleton. Thus, I hope some leaders will read what I share below, and browse some of the other articles I’ve written, and develop comprehensive, long-term youth development strategies in high poverty neighborhoods of the city and suburbs. This is not a problem that will go away after the high profile attention of this past two weeks. As I listened to Congressman Elijah Cummings, MD, talk about mentors in his life, saying “I’ve had one mentor since I was 16;” and “We must do our part so they can deliver their gifts to the world;” I though of my own mentee, Leo, who I met in 1973 when he was in 4th grade. We’ve stayed connected ever since then. A few years ago we met on Thanksgiving morning at a Starbucks in Chicago and passed a video camera back and forth recording how important each of us had been to the life of the other. While many workshops focused on data and evaluation and accountability, I was struck by how little data was used in keynote presentations to show the distribution of programs and resources in different parts of the country. Furthermore other than showing a commitment to build the public will, I did not see an outline of a year-round strategy, or the engagement of partners from many different sectors to support the advertising frequency and reach needed to gain and sustain public and private sector support for a decade or longer. I did not hear anyone talking about building a distribution plan to make programs available in more places. This does not surprise me. In my frequent Google searches I can’t find sites that focus on this the way I have done since 1993. In the main sessions of the Summit I saw lots of story telling, but too little data showing where mentoring is most needed, or where programs are already available. What numbers of kids need mentoring, based on age, demographics, economics, or other indicators? If the data were being collected, it can also be mapped. No maps were used in the keynote sessions, or in workshops I attended, to show what populations of young people MENTOR seeks to serve, based on poverty, school performance, violence, or any other indicator. Such information is being mapped in many places and could be used on a national level to focus attention on areas with greatest need. The New York City initiative could have included maps in its presentation but did not. Maps could also be used to demonstrate level of program distribution in these areas, and to highlight under-served areas. Without this information it’s difficult to lead any kind of on-going effort intended to reach kids in more areas, and to know if there is a growth in program reach from year to year. New forms of mentoring, such as those targeted at adopted youth and youth with special learning needs (ADHD, etc)are exciting. However, they make the target for mentoring a mixed bowl of fruit. I think that in most forms of mentoring, our goal is to help youth grow up to be good citizens and productive adults (is it?). However, youth from different social/economic backgrounds have different levels of support already available in their lives. I think maps could help clarify the areas of the country where kids need the most help, while other forms of visual organization can still show that kids from many different backgrounds have a need for specialized forms of mentoring and extra adult support. I also did not find any workshops that showed strategies, or talked about building strategies, that would support year-round efforts intended to reach some of the goals of MENTOR, such as building public will, or increasing the number of volunteers, or the number of dollars supporting tutor/mentor programs. While National Mentoring Month is in January, events need to be taking place in other months. National Mentoring Month is led by the Harvard School of Public Health, not MENTOR. Perhaps other events throughout the year could become part of a year-round effort to draw attention and mobilize resources for mentoring programs and networks in various cities and states. With the need for year-round strategies that mobilize resources for programs in different neighborhoods and cities, I feel the media also have an expanded responsibility. The PBS American Graduate effort and the NBC Education Nation campaign are two of many media campaigns that focus on different parts of the same overall problem, but seem to compete for attention. If every media outlet in each city included a "take action" section on their web site, encouraging companies, faith groups, universities and individuals to do something today -- volunteer, donate, partner, etc. --, every story could be part of a larger on-going effort to build public will and draw needed operating resources and talent to all tutor/mentor programs in each city. MENTOR could put together a calendar showing all of the different media events, and work to have them point to the MENTOR web site and other sites where people can become involved in local programs. As media become more focused on generating resources, not just attention, I’d like to see the September American Graduate and Graduation Nation events move into late August, or have a build up that starts in late August, to have greater impact on volunteer recruitment in the first few weeks of Sept. Programs have screening, matching and other work to do with a volunteer before they are matched with a youth, which could last until mid October, which means the first six weeks of the school year is lost and for some kids who get into the wrong peer group, they may be lost forever. In the same line of thinking, National Mentoring Month could have a December launch, intended to influence more charitable support of mentoring programs, not just the intermediary organizations. Tracking impact of our campaigns and showing flow of attention and resources directly to local programs would be a useful tool. I created this graphic to illustrate the idea. Can we develop tacking system that automatically captures “opens” on different web sites resulting from a “campaign” such as the Kansas, Iowa, Nebraska Coaches Recruitment Competition? The Coaches Competition organized by Kansas, Iowa, Nebraska is pretty unique and could be duplicated in other states if the leaders and resources were available. Lots of work was involved in organizing this. Playbook of the three states organizing this is available. It would be great to have someone keeping a master list of such campaigns. 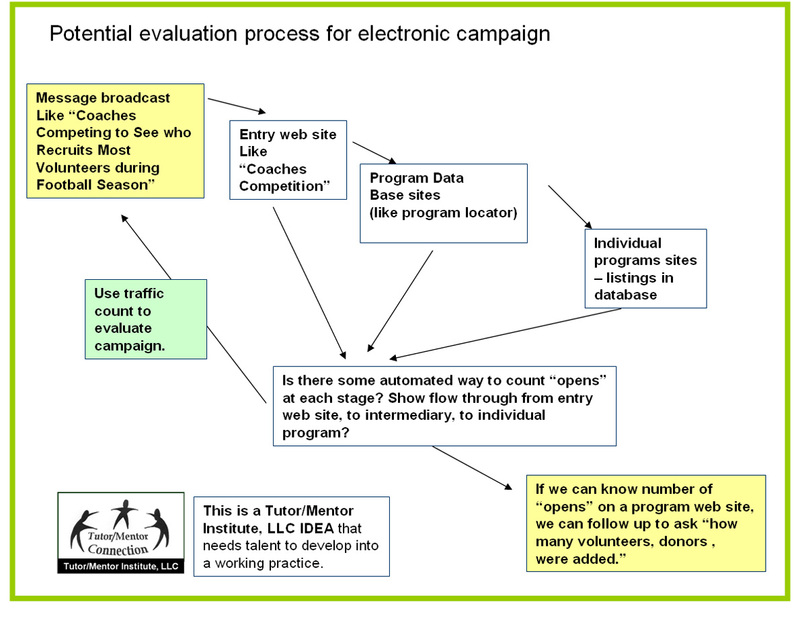 A map showing colleges or sports teams with mentor mobilization campaigns could be useful. A map showing businesses with strategies for mobilizing and supporting volunteer-based mentoring programs would be useful. 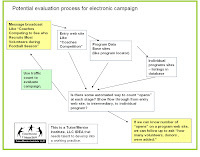 It would be even better if every city had a master database of tutor/mentor programs that various campaigns were using throughout the year to point volunteers and donors to, and that were being used to show the effect such campaigns were having on the distribution of programs in places where they are needed. I wrote down many of these thoughts as I attended workshops at the Summit this year and in 2012. I could only attend a few of the workshops and probably won't find time to go through all of the archives to learn what else was presented in other workshops and planning sessions. However, I did not see any presentations outlining tipping points, or theory of change, focusing on strategies that build and sustain mentor-rich programs in high poverty areas of big cities for the many years it takes for a youth to go from first grade to first job. Perhaps these were being shared in workshops I did not attend, or are on web sites of some of the organizations partnering with MENTOR to host the Summit. If they are, please share links so I can expand my own library of strategies and collaborations. As we learn more of what works in different parts of the country we can use blogs, MOOCs, Facebook, Linked in and other on-line media to share these ideas so they can work in more places. I hope that by sharing my ideas others will be stimulated to share their own thinking on blogs like this or on wikis and web pages and that we can connect and gain greater attention to such strategies as we move from this year’s Summit to next year’s summit. Today's Chicago Tribune Editorial titled "Protecting our Own" shows photos of six high profile killings since 1984. The editorial laments "we've been there before" and repeats "it will take more than new policing strategies". It ends with "Chicago needs a new commitment to protect it's own." 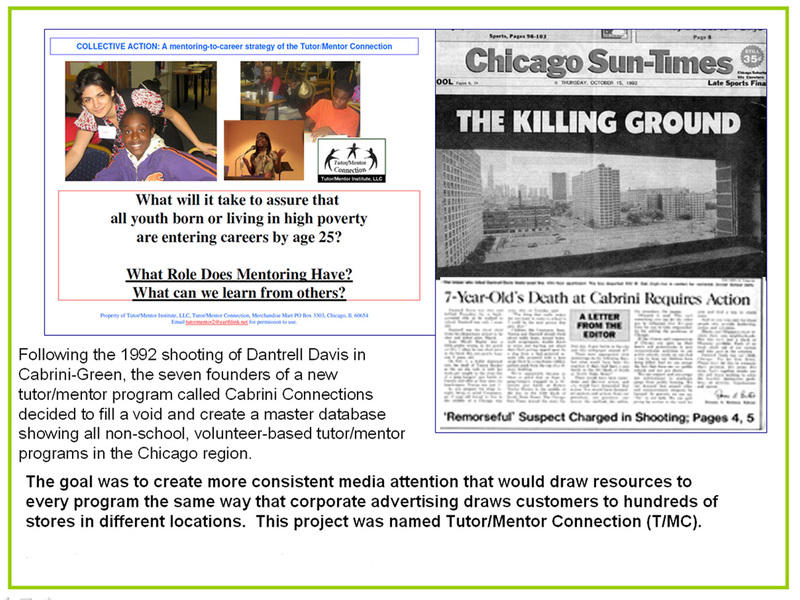 I've been giving this message for over 20 years, since 1992, when I formed the Tutor/Mentor Connection (T/MC) in the weeks following the killing of Dantrell Davis. This front page of the October 1992 Chicago SunTimes has the same call for involvement. While the media are once again highlighting this problem, and we're starting a new year, I encourage you, your company, your high school, your social and civic group, to organize reading and reflection circles that read the articles I've posted, follow the links to the other web sites I point to, and consider advertising based strategies that draw needed attention and resources to every high poverty neighborhood, so that more needed youth and family services grow in places where they are needed, and so they stay in place and constantly improve over the next 20 years. Look at this Role of Leaders strategy and this Collaboration Strategy. Implement these ideas now. Grow them from year to year. I don't expect anyone to understand all of this in a few days. 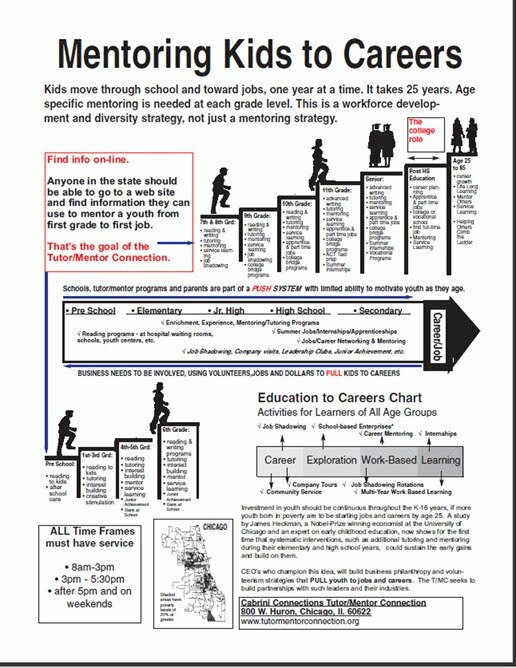 I've spent 35 years thinking about ways to connect volunteers and youth and keeping a tutor/mentor program operating in a high poverty neighborhood. Had city leaders adopted some of the ideas I've been sharing since 1993 perhaps we'd be in a different position today. Adopt these ideas now and perhaps in 20 years we won't have another set of pictures with a new call to responsibility.